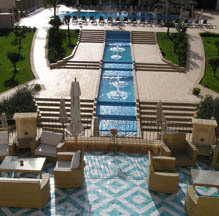 The Kempinski Hotel Giardino di Constanza Resort & Spa has captured the essence of Sicily with its Arabic-Norman inspired architecture, gardens and fountains, opulent marble used throughout the hotel, 2,100 square meter Daniela Steiner Beauty Spa, which features natural Sicilian products, and their Dubbesi Restaurant, which treats guests to the rich flavors of the island. In November 2005, Edward F. Nesta and I stayed at the opulent 91-room hotel, which features 13 suites and junior suites, as well as 2 penthouse suites, with private terrace and pool. We flew to Palermo, Sicily, rented a car at the airport, and were mesmerized by the spectacular scenery as we passed ancient ruins, olive groves, vineyards, and rugged mountains, during our 1-hour drive from the Palermo International Airport to Mazara del Vallo. 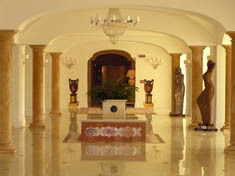 We were impressed with the hotel from the minute we drove up the long driveway, and entered the striking reception area with its inlaid marble floors, columns, Arabic-inspired fountain and life-size sculptures by a local Sicilian artist, Domenico Dora, as well as the exotic floral arrangements located throughout the hotel. We entered our guestroom through a terracotta tiled foyer that featured an armoire with a large safe, mini-bar and ample closet space, and led into the spacious bedroom, which featured teal walls, a king bed with a wrought iron and upholstered headboard, a desk and chair, as well as a comfortable sitting area with 2 chairs and a coffee table. The gracious ambience featured antique prints of Sicily, as well as a rectangular gilt frame mirror, 3 antique-design petit point carpets, wrought iron sconces, floor and table lamps, and the bed was dressed with a white duvet and comfy pillows that beckoned. French doors draped with blue, gold and green floral fabric opened onto a small balcony with 2 chairs, which had a spectacular view of the “campagna” (countryside), the large fountain and gardens, as well as the citrus trees and vineyards. In-room amenities included 3 telephones, a LOEWE Plasma television, Philips CD/Radio/Alarm clock, and trouser valet. Turndown service was a sweet surprise each evening, when we found a delicious cookie under a glass cloche on a white china plate on our bedside tables. The elegant marble bathroom had a deep soaking tub, a walk-in shower with a tile bench and a large rain showerhead, and private toilet and bidet. The wide vanity featured double sinks, and there was a vase of lush white orchids, and a shaving/make-up mirror. Amenities included luxurious robes and slippers, a scale, hairdryer, as well as hand-painted and signed ceramics, including a ring holder, and an assortment of Kempinski branded amenities. The hotel features an outdoor negative edge pool with a swim up Citrus Pool Bar, an outdoor family pool, as well as an indoor pool with a wraparound wall of windows, and a Fitness Center. There are grass tennis courts, bicycles for guests to use, an outdoor chess game that is played with large chess pieces on the courtyard, and for children there is a Pony Junior’s Club. Other appointments include a Business Center and a Library off the lobby, where guests can relax. We experienced their Daniela Steiner Beauty Spa, and had a variety of treatments, including their special Sicilian High Salt Energizer, and their Volcanic Clay Treatment, both of which featured natural Sicilian products. The spa is gorgeous, the treatments divine, and the staff is professional and welcoming. Read our article on the Daniela Steiner Beauty Spa in the Spas section. Each evening we were delighted with the piano music that wafted through the hotel from the Lobby Lounge as we made our way to dine in their Dubbesi Restaurant, where Executive Chef Salvatore Barbara and his excellent team: Sous Chef Giovanni de Candido and Pastry Chef Giovanni Ciotta captured the flavors and colors of Sicily and the Mediterranean, and their Enoteca del Mediterraneo that offers guests an excellent selection of wines, including outstanding Sicilian and Italian wines. We look forward to returning to this outstanding hotel. Read our other articles on Sicily and the Kempinski Hotel Giardino di Constanza Resort & Spa in our Destinations, Spas, Restaurants and Wine Cellar sections.